When is the best time to tap sugar maples? 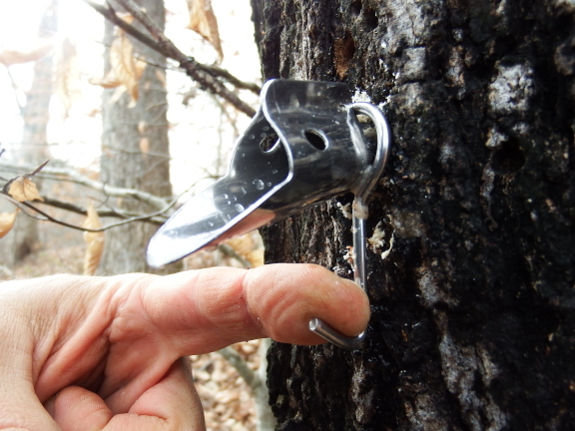 Large-scale maple-syrup operations in New England like to have all their taps in place around the first of March. But we southerners can get a head start on the season and tap earlier. 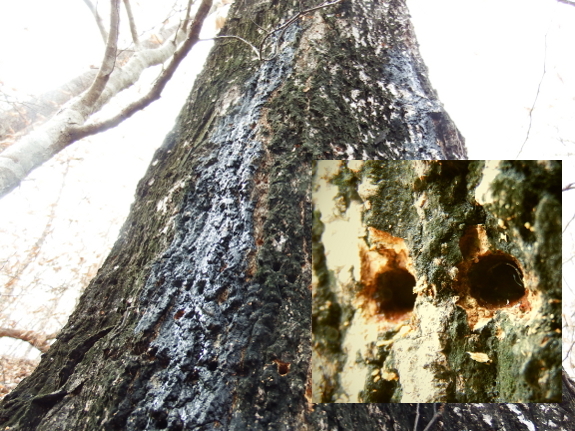 As you can see, sapsucker holes in our favorite sugar maple are already bleeding sap, so why let the tree's sweet juices go to waste? 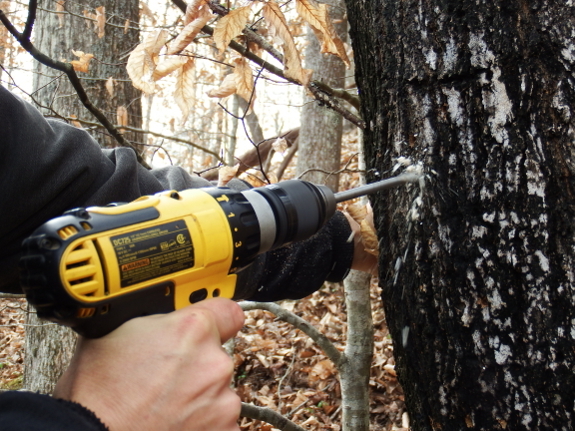 Interestingly, while I was researching the timing of maple tapping, I stumbled across a study in which researchers tapped some trees early (in late January or early February), some at the March 1 time most traditional farmers aim for, and some late. While late-tapped trees did produce lower yields, both early and midseason taps netted the same amount of liquid. Why? Early taps catch sap that midseason taps miss, but those early holes tend to close up before the flow is finished and thus miss the latest sap. So, it's really up to you when you want to tap, and for us, earlier is better --- there's much less to do on our farm in January and February than in March. Mark and I had a lot of fun tapping our sugar maple last year, and we considered expanding beyond one measly spile in 2015. However, my usual morning walk goes past only this one sugar maple, and I'm not sure if I have the gumption to check on trees daily if they aren't on my normal route. Maybe if I get antsy waiting for Abigail to pop out some kids, though, I might expand my walks and our maple syruping operation.